To Cite: Mahmoudieh M, Keleidari B, Mohajeri G, Sayadi Shahraki M, Badihian S, et al. Small Intestine Obstruction Due to Laparoscopic Adjustable Gastric Banding and (LAGB) Migration, J Minim Invasive Surg Sci. 2014 ; 3(3):e19561. Introduction: AGB (adjastable gastric bandin) is the most common method for treatment of obesity which is performed all around the world and provides a significant weight loss for patients. Despite all its benefits as a method that requires the least intervention, complications such as gastric prolapse, stoma stenosis and migration band may also occur. These complications rarely result in mortality, but usually the only treatment for them is surgery. Case Presentation: We report a rare complication of this procedure which had caused small intestine obstruction. Conclusions: Small intestine obstruction caused by band migration is a very rare complication and must be considered as a differential diagnosis in patients with small intestine obstruction symptoms. Therefore correct surgical methods must be adopted for its treatment so that it may not let the surgeon get misled during the operation and let him do the treatment correctly. The incidence of morbid obesity is increasing all around the world which has become a major problem due to various complications and comorbidities. In this condition, non-surgical treatments seem to have a little success chance compared to surgical treatment which is probably the only effective therapeutic treatment. Among various methods of surgery, LAGB (laparoscopic adjastable gastric banding) is widely used throughout the world and the use of this method has also increased significantly compared to previous years. This method is a safe procedure with the least complications and minimal intervention. The most important advantage of this method is its adjust ability and reversibility. Complications of this method rarely lead to mortality, but in most cases the patients are in urgent need for surgical intervention. The most frequent complications are gastric prolapse, erosion and migration, access port problems, pouch dilation, and stoma obstruction. The purpose of this manuscript is to report a case with small intestine obstruction in jejunum caused by AGB (adjastable gastric banding) six years before. A 24 year-old male patient was admitted with small intestine obstruction symptoms which had been started two days earlier. 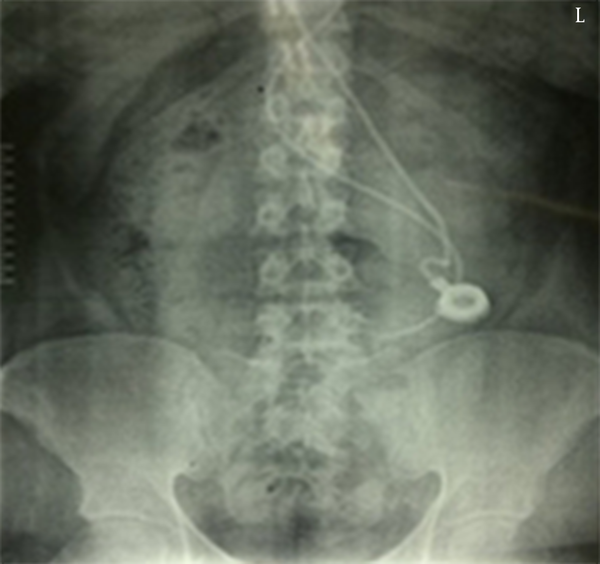 The patient had a history of surgery for insertion of laparoscopic gastric banding (MID BAND) six years before. At that time, the patient’s weight had been 156 kg (BMI = 48 kg/m2) which has decreased to 142 kg during six months after the surgery, but since then the patient did not have any weight loss. After the surgery, the patient has never visited his surgeon for band adjustment and has gained weight despite the therapeutic regimen. Because the military service exempt high-weights from compulsory service, he didn’t follow his treatment regimen till his weight reached to 150 kg. Intragastric balloon has also been placed for him a year ago and he has lost 44 kg in six months. The balloon has been brought out after six months and he has regained 26 kg. Currently he weighs 130 kg. The patient is addicted to alcohol and drinks one liter alcohol per day. He didn’t declare any comorbidities. He was admitted to the surgery ward with septic condition and intestinal obstruction symptoms. No sign of inflammation or swelling was found at surgery site or port implantation site. Abdominal x-ray was taken, in which port and tube were observed, the end of the tube was in abnormal location and the band was not seen (Figure 1). EGD Esophago Gastro Dudenoscopy performed and reported severe gastric inflammation with edema and multiple erosions without sighting tube or band. The patient was scheduled for laparoscopy and band extraction with the diagnosis of gastric wall erosion caused by band and probable leakage due to gastric wall necrosis which has led to intra-abdominal sepsis. After entering the abdomen during surgery, severe adhesions (due to previous surgery for intra-abdominal foreign body) were seen presenting with omental adhesion to abdominal wall, liver and stomach. Adhesions were released to GEJ (gastro esophagial junction) using tube guide and the tube was removed with a little tension, but the band was not found. End of the tube was discolored to green. Given the impossibility of finding the band, laparoscopy was converted to open surgery. In abdominal exploration, the band was not found in the stomach, but small intestine was distended atjejunum. During investigation of intestine, the band was palpated injejunum approximately 100 cm away from Treitz ligament. Enterotomy was done and the band was removed and enterotomysite was repaired. The band and 10 cm of tube were discolored which indicates that these parts were in stomach for long time and were discolored affected by gastric acid. The site of band removal from tube was placed near the band in discolored area (Figure 2). Finally methylene blue test was performed to rule out gastric leakage and the result was negative. Drain was placed for the patient and the surgery was finished. The patient was discharged from hospital in post-operation day of six with good general condition, diet tolerance and drain withdrawal. According to international studies gastric band migration probability is 0.6-14.4 % (1) which can occur any time, especially during 30 to 86 months after surgery (2). The erosion which leads to gastric band migration is usually a slow process (3). Over time, the band rubs the gastric wall and penetrates it till it reaches the gastric lumen. Most patients don’t reveal any symptoms in this period and they only stop losing weight after few months. Our patient also stopped losing weight after a few months which is a symptom of band erosion caused by the band placed on stomach inducing non-functionality. In some cases, band erosion can be manifested by portal infection, but we didn’t have this condition in our case. In this condition, the patient must be evaluated for erosion occurrence, which can lead to acute symptoms including gastric perforation, bleeding or obstruction. The case will then be presented with symptoms, such as sudden abdominal pain, fever, frequent vomiting and lack of defecation. In this condition, emergency surgery is usually needed after hypovolemic shock correction (4). Probably band tension on gastric wall causes erosion and gastric band migration which might be due to increased band pressure caused by over filling (5), or increased pressure in superior gastric pouch due to overeating, eating fast, not enough chewing of food, or gastric wall rejection reaction to band and inflammation of tissues surrounding band (6). In this case, the patient failed to visit his surgeon after surgery because of mistaken notion of seeing this method as a procedure not a process. So he lost the chance of band adjustment and he neglected stopping losing weight and starting gaining weight and all these together caused his band erosion and gastric band migration not to be evaluated. Alcohol drinking and lack of dietary control had caused gastric distension and increased band pressure on gastric wall which had exacerbated the band erosion and migration. On the other hand, use of intra gastric balloon while the patient had LAGB had aggravated this process and led to acute and dangerous complications of band erosion and migration and at last it had caused the band get separated from the tube and migrate to jejunum resulting in obstruction. Gastric band migration can be treated surgically or by endoscopy performed by an experienced endoscopist (7). In most cases, the band is found by pursuing tube in laparoscopic surgery and in the presence of severe adhesions around the band or insertion site of the band, which can be found in most cases, and in case there is gastric band migration or the band can be palpated in stomach, gastrotomy is performed distal from the band and the band must be removed and gastrotomy site get repaired. In case laparoscopic surgery is not possible, it should be done by open surgery (8). In this case, first we started laparoscopic surgery and released severe intra-abdominal adhesions especially from stomach, liver, diaphragm and spleen and then removed the tube with a little tension, but could not find the band. The band was not also palpated into stomach so we decided to convert it to open surgery and through investigation of abdomen, we found the band in jejunum 100 cm away from Treitz ligament which had caused partial obstruction in this site. The band, port and tube were removed by enterotomy and methylene blue test was done to rule out gastric leakage which was negative. Considering that the patient was in septic condition, caused by gastric inflammation and erosion and obstruction due to band, obesity surgery was not performed for him. K. Sapalidis et al. reported a similar case to our patient (9). In their patient, 40 years after the band placement, it had caused small intestine obstruction in jejunum. Laparotomy had been done and, a segment of small intestine had been resected due to adhesion and presence of fistula in obstruction site. In our patient there weren’t adhesion of fistula in the site of obstruction and the band was removed by enterotomy. Gastric band migration is a relatively common complication of LAGB and must be considered in all the patients with non-functional band and especially lately port inflammation and infection. Diagnosis of this complication before occurrence of acute symptoms lets us remove the band by endoscopy which is safer and cheaper. Otherwise, band migration into the jejunum might occur which is a very rare complication. Knowing the risk of such complications and having a strong clinical suspicion for diagnosis, causes proper and safe method of treatment adopted, and following complications can be prevented. Given the high rates of using this method than before, it is necessary that this surgery be done by surgeons who work on obesity treatment, are quite familiar with its indications, post-operative care and follow up, be aware of probable complications, and make sure these complications have not occurred in each visit. In addition to surgeons who work on obesity surgery, general practitioners and gastroenterologists are needed to be aware of complications of this procedure so they can guide the patient in the right direction for his treatment. The authors would like to acknowledge the members of Isfahan Minimally Invasive surgery and Obesity research center for their support to this article. Implication for health policy/practice/research/medical education: Surgeons who work on obesity surgery, general practitioners and gastroenterologists are needed to be aware of complications of laparoscopic adjastable gastric banding; so they can guide the patient in the right direction for his treatment. Authors’ Contributions: Study concept and design: Dr. Mohsen Mahmoudieh, Dr. Behrouz Keleydari, Dr. Gholamreza Mohajeri, Dr. Masoud Sayadi. Drafting the manuscript: Dr. Masoud Sayadi. Critical revision of the manuscript for important intellectual content: Dr. Mohsen Mahmoudieh, Dr. Behrouz Keleydari, Dr. Gholamreza Mohajeri. Development of the protocol, abstracted data, and preparation of the manuscript: Shervin Badihian, Mahsa Gharzi, Samira Davashi. Funding/Support: Isfahan Minimally Invasive and Obesity Center.